The Royalty-free Stock Photography EULA (End User License Agreement) is meant for licensing pre-existing stock photography to your customers with one-time payment for unlimited usage. and product in our contracting for service business." This Royalty-free Stock Photography EULA is included in editable Word format that can be customized in Word or by using the included Wizard software. THIS END USER LICENSE AGREEMENT (EULA) is made this Current Day day of Current Month, Current Year by and between Company Name ("Licensee") doing business as Website URL and Company Name ("Customer"). "Content" - Stock photography ("images") provided to Customer by Licensee. "Content Metadata" - Information attached to Content, including camera information, locations, creation dates, captions and keywords. "Customer" - The individual person or company who paid licensee fees for Content. "Model" - Any recognizable person in the Content, regardless of if they were a professional model or not. "Photographer" - The individual or company who owns the copyright on a specific licensed image. "Usage Authorization" - Authorization by Licensee for use of Content for a specified purpose when required by the licensing agreement. "Download Access Time" - The period of time in which the Content shall be made available to Customer for downloading under the licensing Agreement. Access to download licensed Content for a period of 7 days (one week) from purchase. Customer shall be responsible for making any backup copy of any downloaded Content. Licensee is not responsible for providing future access to downloads of licensed Content after the download access time has expired. Grant of license to use Content as outlined in this Agreement for which license fee has been paid in full by Customer. Customer is granted a non-exclusive, non-transferable license to use the Content per the terms of this Agreement. Customer is allowed to share Content as needed to complete production of authorized usage, such as transmitting Content to separators, printers, and graphic designers working on the Customer's project. Content transmitted to authorized third parties may not be used in any other manner by third parties. Customer is granted a perpetual worldwide license for multiple uses of licensed Content. Include photographer's copyright in connection with the use of the image. For example, magazines typically include the photographer's name in the edge of the image, book publishers typically include photographer's credits in the forward or appendix. Photographer's copyright statement should be displayed as "Photo by Credits", or "(c) Credits". If it is not possible to include photographer's copyright, a Permission Waiver must be granted by the photographer. Digital use of Content requires a URL hyperlink to the Photographer's URL Website URL in the usage credits. Examples include, but are not limited to, Content used in a web site, multimedia CD-ROM, DVD or software product. Include a statement that Content is used for illustration purposes only when using Content showing a recognizable person when such Content is used to endorse a product or service or may be unflattering to that person in any way. It is Customer's responsibility in such cases to determine suitability of the image and consequences of use and to obtain written permission if unsure that Content should be used in such a manner. A design element for educational purposes. Examples include teaching materials and reports. A design element for editorial purposes. Examples include magazines, newspapers and reviews. A design element for commercial purposes. Examples include product packaging, web site illustration, books, promotional materials, advertising, business identity, video, games, etc. Single photo print use for décor. Violate the rights of any other party. Violate any terms of this agreement. Resell or redistribute Content as-is or in a derivative form, by itself, or as part of a product where the Content's digital files are included. Examples include, but are not limited to stock, image galleries, templates, and photo reprints. Transfer rights or allow a third party to resell or distribute Content. Make Content available over a network, peer-to-peer service, or any similar service. Access Content or Licensee services via automated means. Use Content in any defamatory, immoral, illegal, or adult materials. Use Content picturing recognizable people to imply endorsement for a product or service. Provide access codes such as download web pages and user login information to any other party. Downloads from different IP addresses from the same order will be considered downloading by other parties. Violate any laws or regulations of any country or state in which Content is used. Customer agrees to indemnify and hold Licensee harmless with respect to any claims, loss, lawsuit, liability, or judgment suffered by Customer which results from the use of any material provided by Licensee or execution of Service by Licensee or at the direction of Licensee, which has been used in violation of this Agreement. Content is provided as-is without any warranty on suitability for any specific purpose. Customer is fully responsible for use of Content and uses Content at Customer's own risk. Licensee does not warrant that all Content Metadata will be completely accurate. Licensee does not make any representations for the rights to use any individual's name, likeness, or image in any Content or Content Metadata licensed for commercial use without first obtaining a Model Release (which Customer realizes may not be able to be obtained). It is Customers responsibility to retain legal counsel to advise on use of Content when used for commercial purposes. In the event that any party to this Agreement employs an attorney to enforce any of the terms of the Agreement, the prevailing party shall be entitled to recover its actual attorney's fees and costs, including expert witness fees. The parties represent and warrant that, on the date first written above, they are authorized to enter into this Agreement in its entirety, and duly bind their respective principals by their signatures below. 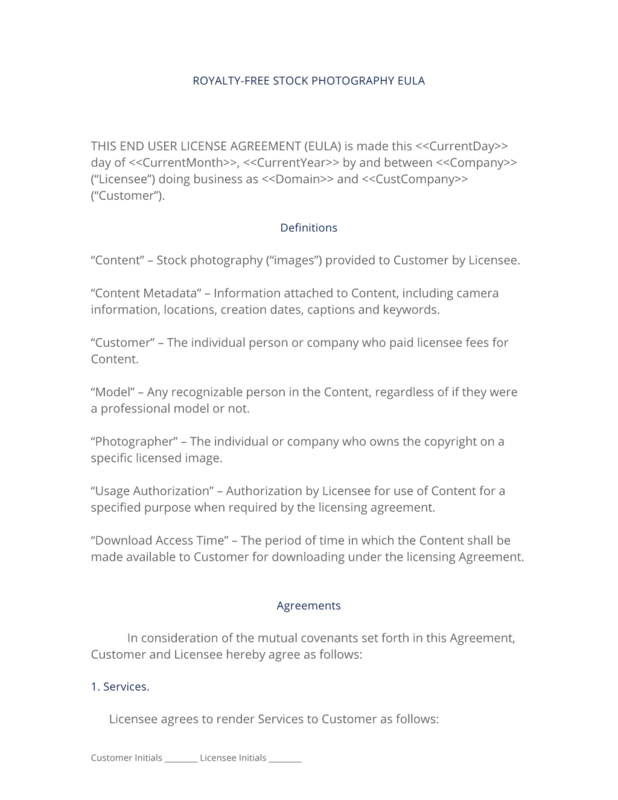 The complete Royalty-free Stock Photography EULA - with the actual formatting and layout - is available in this Contract Pack.